Most of the brand portfolio is in secular decline. Blue Buffalo is a great asset, but management paid a high price. Annual capex budgeting has been low compared to industry peers. Management anticipates 5% cost inflation, an unexpected headwind. The stock trades at 13x forward EBITDA. 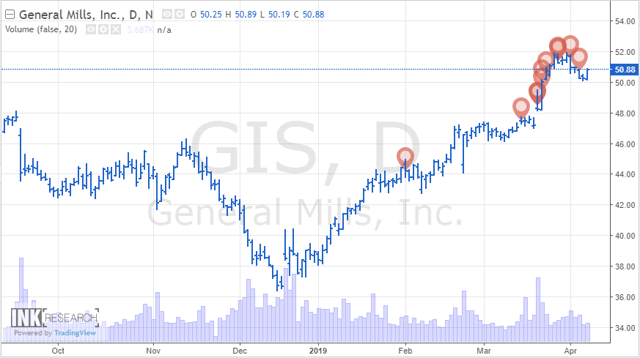 In March 2019, General Mills (GIS) management came out with a strong third quarter and accordingly raised fiscal 2019 guidance. Although, these improvements entirely due to price increases of 3%, offsetting the average 2% decline in organic volumes across all operating segments. Sales have been slowly declining for two reasons. The first factor is that approximately two-thirds of its brand portfolio consists of products that are heavy in carbohydrates and/or sugar. Consumers have become more health conscious by having plant and protein rich diets, especially the last few generations. The second factor is that there are more private labels or in-store brands in the market place than ever before. Major retailers, such as Walmart (NYSE:WMT), Costco (NASDAQ:COST), Kroger (NYSE:KR) and nearly every retailer you can think of, have created their own brands in order to reduce their reliance on costlier packaged food suppliers. In the 9 months period ended February 2019, GIS sales categories of snacks, cereal, and yogurt were all down on a year-over-year basis. The remaining categories were roughly flat. The only area that showed an increase in sales on year-over-year basis has been Blue Buffalo (its pet food products), which has become the primary focus by Wall Street. In fact, the terms "Blue" and "Pet" were actually mentioned a total of 86 times on the last conference call. Why? Blue Buffalo sales were up 8% for the quarter and management anticipates that sales will grow in the double digit range for foreseeable future. General Mills acquired Blue Buffalo last year to return top line growth and it is certainly the most promising channel. Management touts that long-term sales growth should be in the double digit range. In fact, the brand will be on track to control over 4% of total pet food market share this year ($30 billion size). Obviously there are hundreds of pet food brands in the market, but competitors understand that the "premium" end of the pet food market, whereby more consumers are willing to pay more for higher quality food, is where the growth is. Competitors have been heavily pushed their product offerings and advertising spend here. MyPetNeedsThat.com, affiliated with Amazon.com, shows that consumers in 2019 can choose from 20 different brands within the premium dog food market. Given the demand growth in pet food and the higher margins, it's guaranteed that more competition will enter the space in the coming years. So, Blue Buffalo will certainly grow sales as the pet food market expands by 3.4% annually, but gaining incremental share will be increasingly difficult, and so their minimum 10% annual growth target may be a high hurdle. Sales are growing at a decent clip for now and should be on pace to hit $1.4 billion this year. After hitting this target, the acquisition price on Blue Buffalo would be about 5.7x times annual sales. Although, many analysts contended that acquisition was the most expensive purchase in the food brand space. Last year an analyst at Jefferies qualified the transaction as follows: "We like the strategic merit but the price is steep and General Mills will have to work hard to extract value from the deal." The deal was primarily financed with debt, ultimately to maintain a low cost of capital, and some equity. Although the transaction also created approximately $5.3 billion in goodwill, about two-thirds of the total value. In the last few years, the company has recorded cumulative restructuring costs of $1.7 billion. If we account for some execution risk (given the competitive factors, the high price paid, and that most of it was financed with debt), investors could see impairment down the line. Cost inflation has been quite low in the industry for years, but now logistics costs and commodities prices are starting to pick up more substantially. Management announced in the latest conference call that they expect total cost inflation of 5% (versus low-single-digits in recent past). 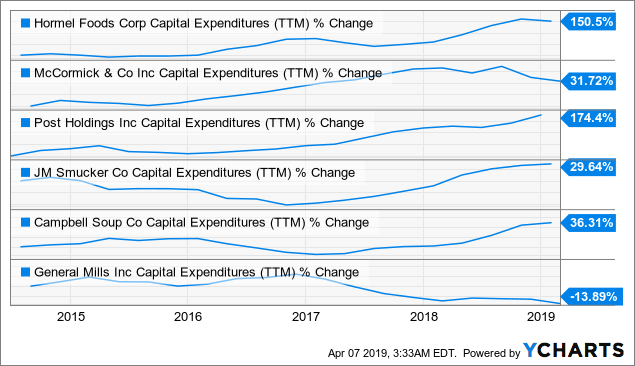 Operating margins will not inflect lower, but it may reduce or even eliminate the benefits that come from future cost savings. Interestingly enough, Fitch Ratings switched their outlook from stable to negative in March following disclosures by the company. General Mills looks fairly valued on a price-to-earnings basis at approximately 16x forward earnings. Analyst consensus also shows flat net profits for the next 3 fiscal years at approximately $2 billion. 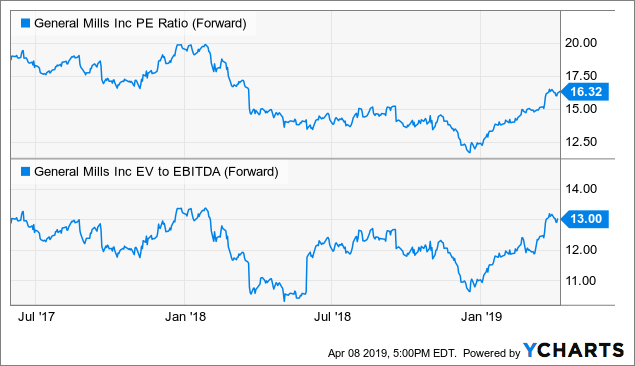 Alternatively, its EV/EBITDA is a touch pricey at 13x forward estimates, which accounts for its $15 billion debt load. Using these two simple metrics, the stock doesn't look like a buy here. Separately, company management has dumped a lot of stock in the last month. Executives can sell their shares for many reasons, but the activity has been quite aggressive with the total transaction value of about $25 million. Sales were executed on behalf of the CFO, the President, and directors as indicated by the red bubbles. If they are selling across the board, why should you be buying? General Mills has been around for nearly 100 years by adjusting to consumer tastes and it will likely remain a decent business. However, changing most of its existing brand portfolio will be difficult as more and more consumers shift to healthier diets. Private label is another headwind, especially for a company that has been consistently raising prices year after year. Blue Buffalo is the crown jewel, but it doesn't come without execution risk either. All in, investors should not overpay for General Mills and avoiding the equity at 13x forward EBITDA seems prudent. Thank you for reading and please comment below.